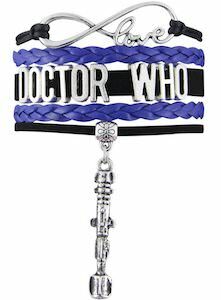 If you are a Doctor Who fan in need of a fun bracelet then you should check out this ID style bracelet. 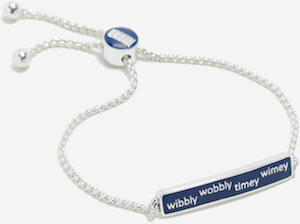 The bracelet is silver plated and has an ID tag on it in Tardis blue with on it the text “Wibbly Wobbly Timey Wimey”. And the bracelet has a bead with the Tardis logo on it and that also helps with making the Doctor Who bracelet adjustable in size so that it fits your wrist just perfect. 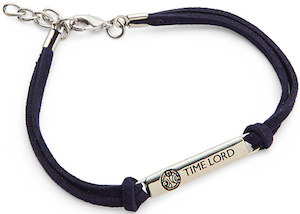 Fans of the 10th Doctor, of course, know the Timey Wimey thing and having it on your wrist really helps you remember. If you want to know where you are then you just need to wear this Doctor Who Tardis compass necklace. 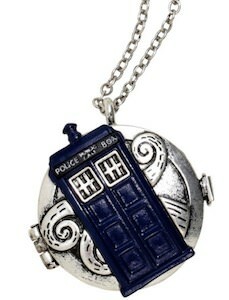 The necklace has a chrome colored pendant that has the blue Tardis on the front. And if you open the pendant you will see the Doctor Who logo on one side and on the other a real working compass so that you can always find true north. It has to be that the Tardis has a big compass to because otherwise it would get lost in space and time for sure. So now you can wear a cool Doctor Who police box necklace with a secret compass inside. This Doctor Who watch has a cool exploding Tardis band and a classic looking digital watch. This is a women’s wrist watch that maybe a bit strange but that makes it extra cool. The strap os the watch shows the exploding Tardis painting and then there is the watch that is a beige color with the digital clock in the middle and around it the text “Wibbly Wobbly Timey Wimey” and it has a small image of that Tardis as well. No this wrist watch is not for a for a formal occasion but it’s great for wearing to work, school and everyday use. 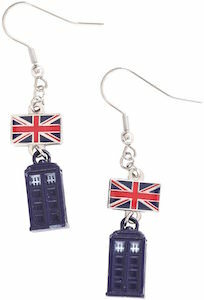 If you are a Doctor Who fan in need of earrings then these Tardis earrings would be just perfect for you. These earrings are different then just a stud earring but that is where it all starts a Tardis studded earring from where 3 chains go up to the side of the ear where a cuff sits on your ear. 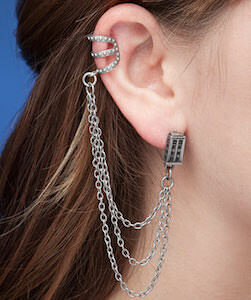 So when wearing these Tardis earrings some chains will move around and that makes them extra fun to look at even though it may not be to obvious for people that these are special Doctor Who earrings. Remember the crack the 11th Doctor found in the home of Amy Pond? Now you can have that crack in the wall as a Doctor Who necklace around you neck. 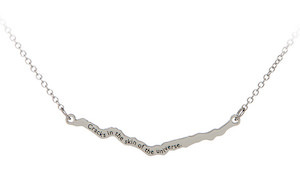 The crack is connects directly to the chain and is almost part of it and that makes it looks subtle but nice and on the crack it says “crack in the skin of the universe”. 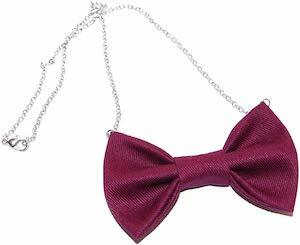 The necklace is made from stainless steel and is 19 1/4 inch long and also has a 3 inch extender. Special jewelry like this is only for the true fans of the Doctor of course but if you are one or know someone who is then this Doctor Who necklace should be part of you jewelry collection. 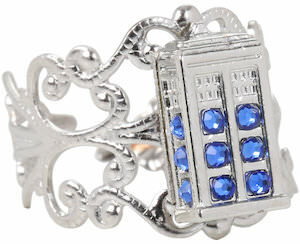 If you are a Doctor Who fan in need of a special Tardis ring then this is the one you want. This silver colored ring is in a filigree style and that means not just a plain band but special metal work that just looks amazing. And to top it all off this Doctor Who ring of course has the Tardis on it and it has blue stones on it to give the Tardis that typical color and that makes this piece of jewelry even more special. The Doctor Who Tardis ring has an open end and that makes it possible to adjust the size so that it will fit you like you want.